Martha Gellhorn's reporting tracks many of the flashpoints of the 20th century: witnessing the Depression in a state of righteous fury, risking her life in the Spanish Civil War, and in the Second World War covering the fall of Czechoslovakia and the Normandy Landings, the liberation of Dachau and the Nuremberg Trials. She reported from Vietnam and Israel; and at the age of 81, she was covering the US invasion of Panama. All her life, Martha fought against injustice. She was influenced by two older women: her mother, who was a social reformer, and Eleanor Roosevelt. Her books of reporting and travel reflected her personality and courage, her novels her shrewd and ironic eye; both were often very funny. Martha died in 1998; at last the true story can be told. This fascinating book reveals much about her life and loves, and is based on primary source material which no previous biographer has seen. 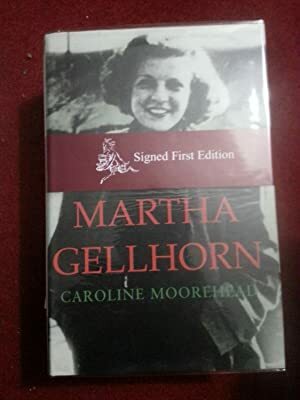 Magnificent new biography of Martha Gellhorn, the war correspondent, whose fearless reporting from the front made her a legend, and whose private life was often messy and volcanic. Ernest Hemingway sent her a telegram: 'Are you a war correspondent or my wife in bed?' She shook herself free of him, and chose to go adventuring.